Snowball was purchased for $5 at a market. She was underage and could not eat or drink properly for herself. If I had not bought her she would have died. I obtained the proper food for her from the vet and needed an eyedropper for her until she was able to learn to eat and drink. Who would have thought that she would have made 18 years old. 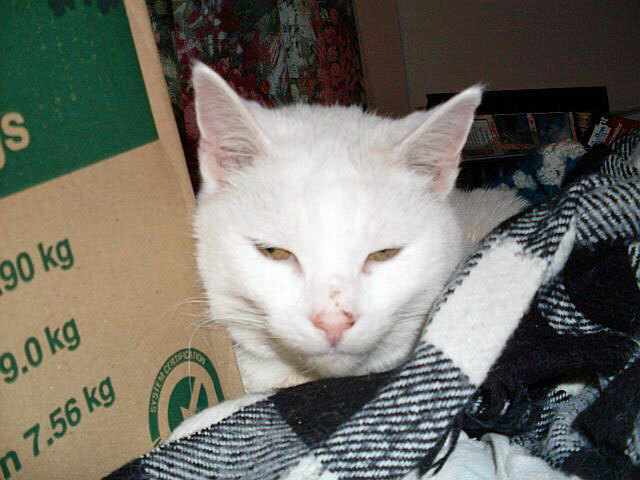 Snowball lived with her sister Megsie for thirteen and a half years. She had several operations on her ears, which I used to put pink zinc on, but the sun got them and by the end she had very little ears left. She finished life in Mulwala, NSW with her mum Liz, her dad Peter and her other brothers and sisters. My companion for 18 years.